More units join the troops rallying on Snodgrass Hill and Horseshoe Ridge. Colonel Hays pieces together what’s left of Croxton’s brigade. The regiments of Connell’s brigade rally around Colonel Moses Walker. Walker is the actual commander of the brigade, but was under arrest for a breach of discipline. With Colonel Connell nowhere to be found, Walker assumes command. 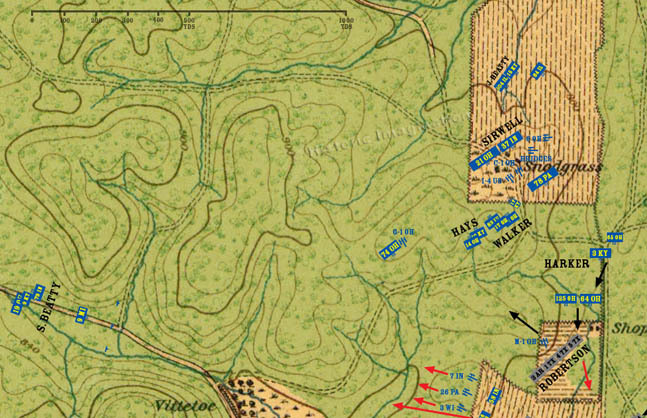 On the Dry Valley Road the 9th Michigan shakes out several companies in a skirmish line and attempts to rally any retreating soldiers that it can.